If you drink tea everyday and wonder if there are any benefits for your skin, then keep on reading! particularly the blood. An increase of antioxidants is a major indicator to healthy skin as well as it helps to reduce skin aging. 2. Green tea formulations reduce sun damage. 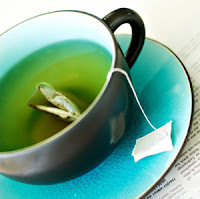 Green tea helps to reduce inflammation and therefore enhances sun protection when consumed. So say goodbye to sunburns, and drink green tea! 3. The consumption of green tea will help slow down the development of signs of aging. Studies have shown that drinking 3-10 cups of green tea for a period of 8 weeks improved the elastic tissue content in the skin. By protecting your skin from sun damage and improving the elastic tissues of your skin, green tea is not only great for a healthy complexion but protect your skin from aging. 1. Freeze freshly brewed green tea as ice cubes and use them as a toner. WoW. I had no idea that green tea could help slow down the development of signs of aging. That's really cool. But do you know if there really are studies to prove this statement to be true? Not saying I question your information, just, I'm curious to know if this is actually a fact. Also, killer image. The colors really work well with the website layout. Please feel free to comment more as I post more articles- comments do make a difference!